Thinking about our looks when going out we consider available options very carefully to go really cool and trendy with a distinct characteristic personality to stand out in the crowd. But no less important is the way we feel in our castles ” homes! For that purpose we must thank the brands that release comfortable and stylish clothing for the home. Our favorite brand Oysho takes care of it once again bringing a new collection of homewear, lingerie and sleepwear for the ultimate rest we could have. It has uploaded new pictures on its official website revealing the Oysho fall 2015 lookbook titled ‘The Road Ahead’ making us pretty enthusiastic to get these lovely staples. Turning to pleasant nudes the lookbook includes soft and light bathrobes, knitted sweaters, nighties and peignoirs, which are so beautiful. We particularly like the idea that several pieces are made of the same fabric and pattern. It creates such a nice harmonic effect on you wanting to wear them as often as possible. And not only the fact of the matchy-matchy style is thrilling, but also the smooth floral prints and touches, which are a perfect feature of this collection. We see baby pink and rosy nighties of shorts and tops that have cute embroidery on the neck, a long knitted cardigan of a greyish creamy color with fluffy threads on the bottom, an oversize beige V-neck jacket that seems extremely cozy. As always the brand creates pieces for the home in a particular way so that you could freely put them on outside as well. The creamy jackets prove it here: you could definitely sport the elongated ones with slim dresses, the shorter ones with your denim pants and everyone would appreciate the nice outfit of yours never considering these improper for going out. As for the lightweight black pieces with white floral prints ” slouchy wide leg pants and jackets, a knee-length super light dress with cross-back straps and a morning robe ” these are meant for home only, meaning that only very special people are allowed to see you in these garments looking so open and peaceful. One particularity of this line is that not only matching patterns and fabrics are so desirable, but also the numbers that have been so skillfully put together to create a comfy and cool home look. Just look at the combo of orange top, checked pants and silk cardigan: isn’t that fabulous? It is, indeed, as you would never think of a better variant to match three different prints together to look so good. Hardly anyone has a question about how this young brand has become so popular. 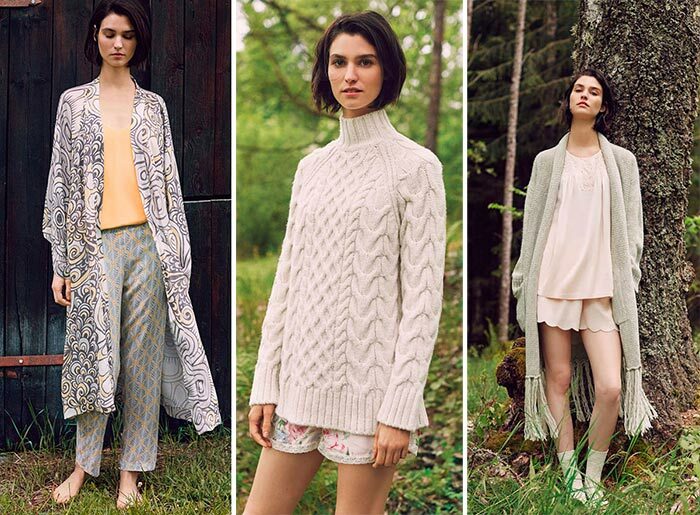 Being the youngest child brand of the Inditex Group, Oysho keeps up perfectly with its siblings Zara, Bershka, Pull & Bear and Massimo Dutti creating the most comfy pieces in accordance with latest design tendencies at a pretty reasonable price range. It is not surprising that Inditex is now valued at $100 billion: people really do appreciate the genuine offers it always comes up with. 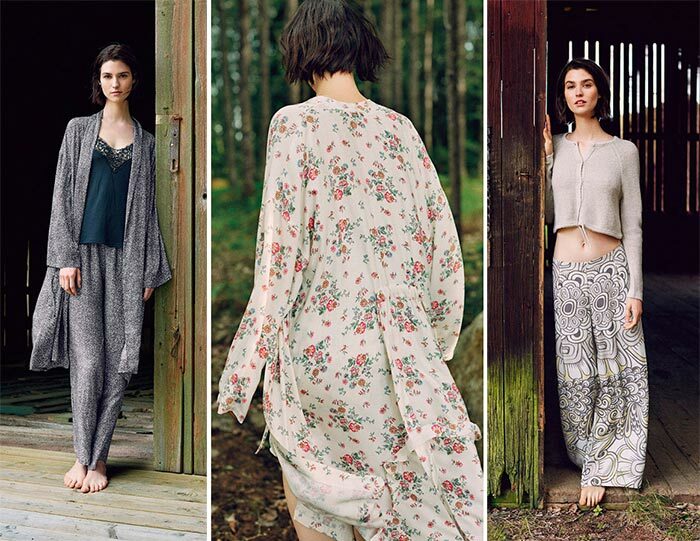 And the new Oysho fall 2015 lookbook with pretty fine and trendy numbers is the next coin in their wallet.